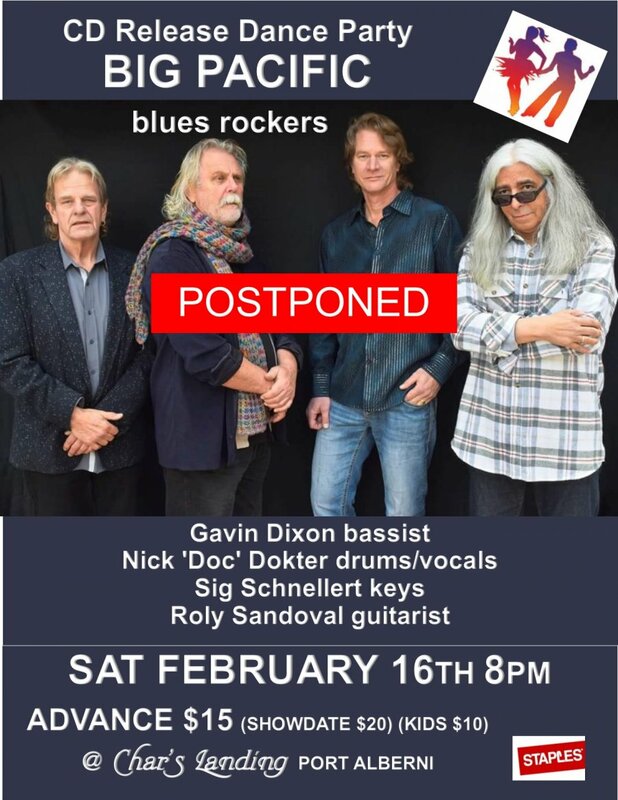 Postponed due to health reasons. New date TBA. Here's to feeling better soon ! Big Pacific is a band that runs the gamut of original blues/rock 70s music, in the style of Cream, Little Feat and even Huey Lewis and the News. Fans of guitar-driven, blues-based classic rock will want to keep their ears open for Big Pacific this fall. The south island-based band has wrapped up production on its eponymously-titled EP Big Pacific, featuring four original new songs recorded in drummer Nick Dokter’s Ladysmith studio and engineered by its ‘fifth member’, Ron Obvious Vermuelen. Big Pacific wears its influences proudly: listeners will be reminded of a gamut of 70s music, from Cream to Little Feat and even Huey Lewis and the News, all wrapped in the tight professionalism of musicians who have entertained audiences across Canada and around the globe.